We’re incredibly excited to have the opportunity to work with you through WeDigBio so that we can move forward with digitizing our crabs! And a large part of our excitement is because of you. So what are these crabs? And who are “we”? Immodestly, we’ll start with “we”: we’re the Marine Biodiversity Center (MBC) at the Natural History Museum of Los Angeles County (LACM). Despite the provinciality of “county” in our name, LACM has some of the world’s largest specimen collections in numerous disciplines. The MBC began its life over fifteen years ago as an initiative to sweep up many of the “orphan” subcollections that had accumulated in LACM’s marine section. Because of its intrinsically cross-taxon nature, the MBC has matured into a center for integrative biodiversity studies, sidestepping the classical taxon stovepipes of the traditional museum world. But back to the crabs. One of LACM’s largest collections is of marine Crustacea — one of the biggest in the U.S. and the world. Crustacea are a subphylum that also includes shrimp, lobsters, crayfish and barnacles to name a few. For this project, we’ve chosen to focus on crabs of the family Cancridae, of which there are thousands in the LACM collection. Why the Cancridae? OK, let’s be honest here: they’re cute. And they taste great. (Always choose a research subject you can eat. [Of course, no one is suggesting that museum specimens are edible — particularly not ones that may have been in formalin. But I digress.].) More objectively, there are a number of reasons that make the family Cancridae a compelling target group. Our current phylogenetic understanding (e.g., evolutionary history) of the family comes mostly from fossil evidence, and it would be fascinating to explore those hypotheses with extant specimens. Extant organism are ones that are still living, while many fossils represent organisms that have gone extinct some time in the past. The Cancridae include a number of commercially important species, such as Dungeness Crab and Rock Crabs. On the west coast of the United States, different states regulate fisheries of these crabs in radically different ways: some states individually regulate the species, while some lump them all together. That’s a situation that could be better informed using museum specimen data. LACM’s collection of Cancridae dates back to the early twentieth century. A significant proportion of the specimens came from the massive collecting efforts of Captain Allan Hancock, a Los Angeles oil magnate early in the last century, who had a deep interest in marine collections. Key qualifications for biologists on his expeditions included musical talent — Hancock was unwilling to be trapped on a ship without entertainment. With this digitization project, we will learn just how much of this subcollection is Eastern Pacific, and how much has been added from the rest of the world. 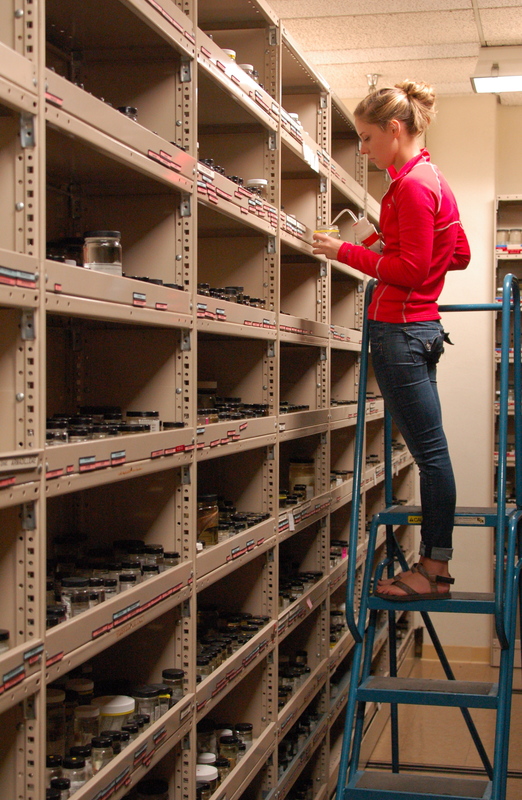 But there’s a problem: if these specimens are so important and interesting, why haven’t we digitized them already? The short answer: it’s hard. The problem is common to many “wet collections” (specimens in jars of alcohol): it’s ludicrously time-consuming to get the labels out so that the data on them can be captured. 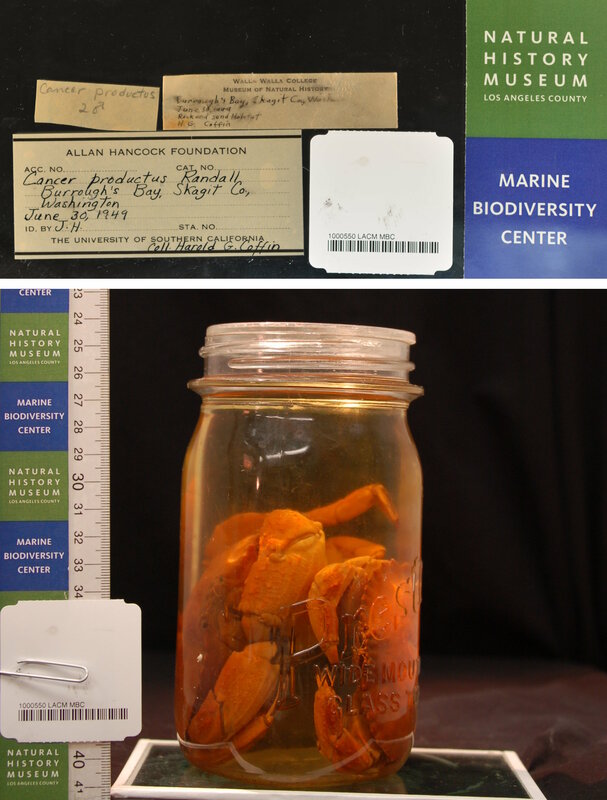 Over the years, researchers have added supplementary information to the specimens, hence many jars have multiple labels, any or all of which may be critical for understanding the importance of the specimen. Each label has to be removed, laid out, and imaged before data capture can begin. Even after the labels have been imaged, the text that has been printed or written on them needs to be captured in machine-readable form. The combined effort needed to get the labels out of the jars, image them, and then enter the data just isn’t something we have the staff to tackle. Having the opportunity to engage a broader public gave us the incentive to get started. Over the last few months, we’ve designed and implemented a label (and specimen jar) imaging system, developed software to process the label images, and prepared ourselves for label data analysis. Now that we know you’ll jump in to help us do the actual data capture from the labels, we’ve been able to get the preparatory work done. That’s the magic of unfolding our institutional box to the public in a project like this: we get to give you a peek into some of life’s coolest specimens, and your help gives us the ability to achieve digitization that we wouldn’t (couldn’t!) achieve without your help. Thank you for your work with our collection and all the other WeDigBio-associated collections — not only are you contributing to projects that are describing the scope of life on earth, you’re making those projects possible. Many thanks to Rafe LaFrance, our Notes From Nature developer, for his help making Crab Shack come to life under a short deadline!